Nordic Federation of General Practitioners (NFGP) is a forum for collaboration between the Nordic general practitioners in Denmark, Norway, Sweden, Finland and Iceland. NFGP is owned by the five Nordic Colleges of General Practitioners, and is responsible for the publication of the Scandinavian Journal of Primary Health Care and for the coordination of the organization of the Nordic congresses of general practice. 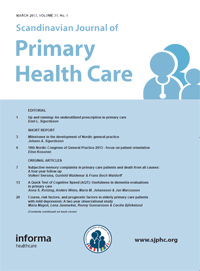 Scandinavian Journal of Primary Health Care (SJPHC) is a Nordic journal within family medicine (IF=1.809 in 2017). The Journal publishes original, peer-reviewed research on topics related to general practice and primary care. and state of the art.